The wrath of God is what takes place at the end of The Great Tribulation. Many times when we hear about The Great Tribulation, we place our focus on the doings of The Antichrist during that time. The Great Tribulation indeed, is going to be a terrorizing time for the Christians that are born again during that time. The Antichrist will come after them with no mercy. I believe that many people will be saved during that time; that is what makes this The Great Tribulation. If everybody is in agreement with the Antichrist there is no need for problems. 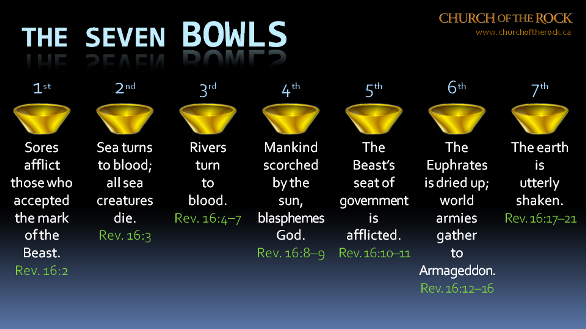 The first bowl of God’s wrath is going to deal with those that agreed to worship the Beast and were given the mark of the beast that enables them to buy and sell. They will be punished with rotten wounds. This second bowl will cause the water of the sea to turn to blood. This will cause every living thing in the sea to die, which means that the food supply from the sea will be gone. This blood is the blood that will also have a rotten smell, as it is the blood of dead people. 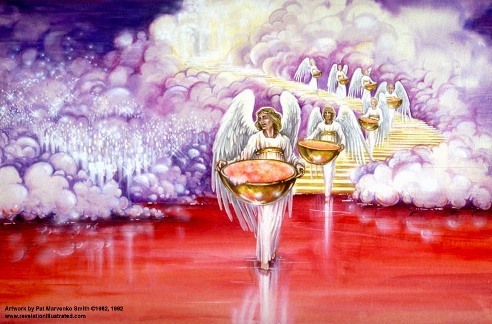 With this bowl of God’s wrath, drinking water is awfully damaged, but also the animals on earth will be greatly affected. So, not only that food supply is not good, but also water supply is also awfully affected. So far, with only these first three bowls of God’s anger, you have people with decomposed wounds, seas turning to blood, all animals in the sea dead, no drinking water and the animals on the earth either dead or greatly affected. You would think that this is enough damage, but God is not done releasing His judgment yet.